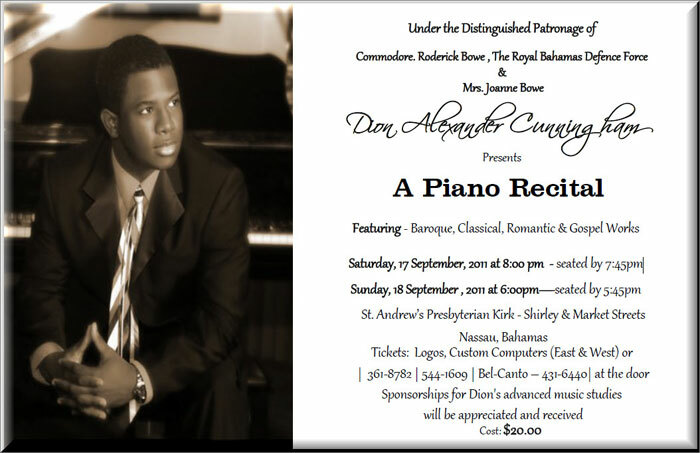 Recipient of Harry C. Moore Scholarship, awarded by Lyford Cay Foundation, Dion is hosting his first recital in The Bahamas, Saturday, September 17th and Sunday, September 18th at the St. Andrew's Kirk. He was recently accepted into the renown Peabody Conservatory of Music, John Hopkins in Baltimore to pursue his Master/Doctorate in Piano Performance. 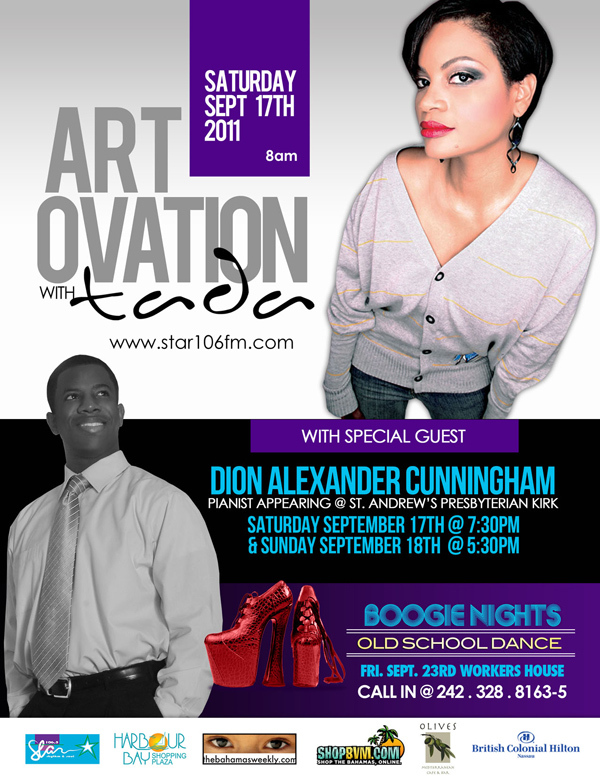 Currently Dion is in Baltimore and has begun studies, but will be here this weekend. Past credits include accompaniment for the Bel Canto Singers, involvement in the Music Ministry of Christ Community Church and he is also a Cellist in The Bahamas Symphony Orchestra. Dion considers himself fortunate to have been afforded the opportunities and training that he has received thus far in his short life. His vision to see The Bahamas produce world-class musicians and music educators, which requires advanced training. The Conservatory has been the catalyst that has launched the careers of many internationally celebrated musicians and educators. He is humbled to have this coveted opportunity to represent his country on such a stage. The honor of being the first Bahamian to pursue a graduate degree in Piano Performance at this prestigious institution is one that Dion does not take lightly. The training and connections made will undoubtedly augur well in pursuit of his dream to create a world-class performing arts academy here in The Bahamas which will be a source of national pride for Bahamians and the envy of the region and the world. The reality however, is that the expenses for his education are significant and without funding assistance, he would be unable to attend. Dion’s first encounter with music was as a pre-school student at Dandy Lion, Nassau Bahamas, where he learned to draw his first Treble Clef and Whole Notes on the Music Staff. His formal piano lessons began at the age of four, under the tutelage of Mrs. Dawn Sands. As a teenager, Dion began playing piano in his church, Christ Community Church. A graduate of Thelma Gibson Primary and St. Augustine’s College, Dion attended Macalester College on an academic scholarship where he received degrees in both Biology and Music. During his time abroad, Dion studied piano under the tutelage of Don Betts and also served as the accompanist for the Macalester Women’s Choir. He also founded the Voices of Tamani – a student run Gospel Choir. Come and party with Star 106.5 FM at Workers House, on Friday, September 23rd. Dr Lutz and Baldy will be providing the best Old School/ Golden Oldies music and Happy Hour starts at 5:30pm with Karaoke.